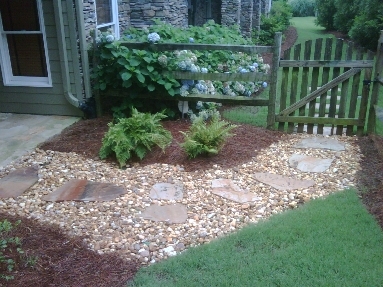 It is the time of year for pinestraw or mulch refreshing in your Atlanta landscape. Whether faded, decomposed, or just looking kind of shabby, a fresh layer of mulch or pinestraw is an easy way to spruce up flower beds and tree surrounds. There are many variables to consider when choosing to use pinestraw or mulch in your landscaping in Atlanta. When considering pinestraw, there are many positives points. Pinestraw is light weight, so it is easier to move. It looks more natural, and pinestraw breaks down better over time compared to mulch. Additionally, pinestraw is a lower cost option as it is sold by the bale. When it rains, pinestraw tends to stay put more rather than get carried away with the water. There are many positive aspects regarding wood mulch as well. Wood mulch tends to hold its color better than pinestraw, and is generally better for soil as it decomposes. This is a heavier option as compared to pinestraw, so it is not as easy to move if necessary. One drawback to keep in mind regarding wood mulch is that it tends to invite termites. Whether you choose pinestraw or wood mulch, a fresh installation does not take long at all. Our experienced landscape team is able to efficiently and quickly install mulch and pinestraw. Contact us for professional installatio in Atlanta.